We have a primary aim of 100 new commissions by 100 contemporary composers within the next 10 years, seeking out the world's most talented composers to write 21st Century 'Reflections' on early masterpieces. We're incredibly proud of the works that our Composers have written for us and enjoy a breadth of styles, ages, backgrounds and nationalities. ORA focusses on supporting British Artists, but has also enjoyed commissions from American, Estonian, German, Swedish and Spanish composers. 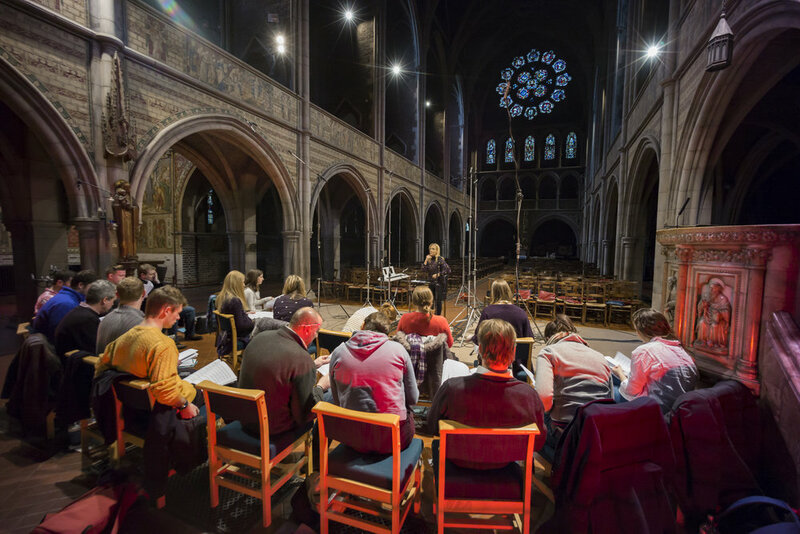 Our aim is to create an anthology of choral works that, in the centuries to come, will be looked on as an encapsulation of the greatest pieces of the second 'Golden Age' of choral music. Our full list of composers, including links to their works and biographies, can be found on our ORA Singers website. You can listen to all our recordings on Spotify, Itunes & Deezer, as well as purchasing from Amazon, Presto Classical, Itunes and all other major retailers. Performance is also a vital part of our commissioning programme as we premiere all of our new works in these exciting concert productions. This way, the works are truly illuminated and this unique presentation style enables our audiences to vividly remember the new commissions and the experience as a whole! Stay up to date with ORA Singers work! Join our Mailing list, or follow us on Facebook and Twitter.